If you had been following the news lately, a preview version of Windows Phone 8.1 SDK were distributed to selected beta testers earlier this week, which were then inevitably leaked to the internet. The SDK included not only development tools, but also the Windows Phone 8.1 emulator and all of its accompanying documentations. WPCentral has a good coverage of all the new features that were found in the SDK, but as Tom Warren from The Vergehas hinted, the leaked SDK emulator only contained a portion of what’s to come in Windows Phone 8.1, and there are a lot more features left to be unveiled. Customisable Start screen background – Yes, you will finally get more than black or white as the background of your Start screen. In fact, you will get more options than simply colors as Microsoft will allow you to choose you own Start screen background image. This is similar to Windows 8.1 where Microsoft included a option for users to customise their own Start screen background. Three-column layout for all devices – Currently, only certain devices with large screen and enough DPI like the Nokia Lumia 1520, 1320 and Icon were able to display the three-column Start screen tiles layout. However, it appears Microsoft may introduce a “Show more Tiles” toggle for users to enable this layout for all devices. Internet Explorer 11 tabs syncing – You will finally be able to synchronise your Internet Explorer tabs across devices (including Windows 8.1), such that you can “pick up where you left off”, provided you use the same Microsoft account across the devices. 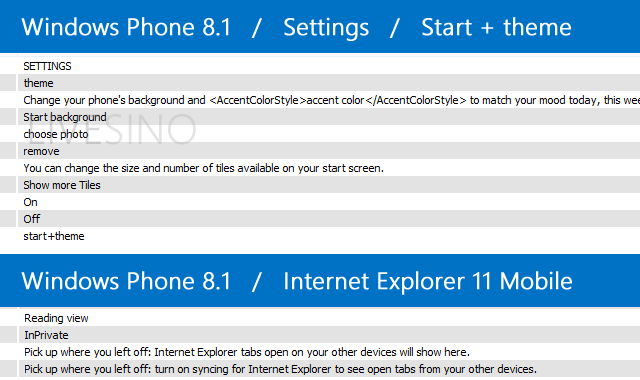 Internet Explorer 11 Reading view, InPrivate mode – Also added to IE11 Mobile on Windows Phone 8.1 is Reading view and InPrivate mode, bring it more in line with the full version in Windows 8.1. As we’ve said earlier, there are a lot more coming to Windows Phone 8.1 than what you’ve seen in the recently leaked SDK. For one, the highly-anticipated Cortana personal assistant and Action Center were yet to be revealed, and don’t you find it strange that Microsoft disabled the Bing search button in the SDK emulator?